Photograph of Manuel de Falla from the 1920s. 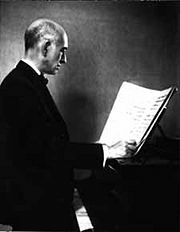 Manuel de Falla y Matheu (November 23, 1876 – November 14, 1946) was a Spanish composer of classical music. Manuel de Falla was born in Cádiz. His early teacher in music was his mother; at the age of nine he was introduced to his first piano professor. From the late 1890s he studied music in Madrid, piano with José Tragó, and composition with Felipe Pedrell. In 1899 by unanimous vote he was awarded the first prize at the piano competition at his school of music, and around that year he started to use de with his first surname, making de Falla the name he became known as from that time on. A defining aspect of late Romanticism was an profound interest in spiritual and mystical subjects. Falla was known to have strong religious convictions and he also possessed a fascination with spiritual phenomenon. The narrative of his well-know composition El amor brujo deals with the topics of the supernatural, sorcery and ghosts. At the outset of the twentieth century, there were few native Spanish composers who had made their mark on the international music scene. Most art music in Spain was "imported" and there was a particular interest in operas of composers from Italy. Manuel de Falla’s early success in the realm of opera composing marked an important step in the development of a Spanish tradition in art music. Falla's gift for evoking the character and spirit of his native country though his music won him many admirers including Claude Debussy, Sergei Diaghilev, and Paul Dukas. By the end of World War I and the early 1920s, de Falla had established his reputation as an internationally celebrated composer. Manuel de Falla as an young child. As composers of the late Romantic era looked to literary and folk influences as inspiration for their creativity it spawned numerous compositions based on the legends, folklore, history, and mythology of their native countries. Composers such as Antonin Dvorak, Bedrich Smetana, Nicholai Rimsky-Korsakoff, and Isaac Albinez, to name a few, often based their works on these particular aspects. It was from Felipe Pedrell, during the Madrid period, that de Falla became interested in native Spanish music, particularly Andalusian flamenco (specifically cante jondo), the influence of which can be strongly felt in many of his works. Among his early pieces are a number of zarzuelas, but his first important work was the one-act opera La vida breve (A Brief Life, written in 1905, though revised before its premiere in 1913). De Falla spent the years 1907 to 1914 in Paris, where he met a number of composers who had an influence on his style, including the impressionists Maurice Ravel, Claude Debussy and Paul Dukas. He wrote little more music, however, until his return to Madrid at the beginning of World War I. While at no stage was he a prolific composer, it was then that he entered into his mature creative period. The nocturne for piano and orchestra Noches en los jardines de España (Nights in the Gardens of Spain, 1916). The ballet El amor brujo (Love the Magician, 1915) which includes the much excerpted and arranged Ritual Fire Dance. The ballet El corregidor y la molinera (The Magistrate and the Miller's Wife) which, after revision, became El sombrero de tres picos (The Three-Cornered Hat, 1917) and was produced by Serge Diaghilev with sets designed by Pablo Picasso. The Diaghilev production of "the Three-Cornered Hat" with the Ballet Russes took place in London on July 22, 1919. In addition to having the sets and costumes designed by Picasso (his first such endeavor) the eminent Swiss conductor, Ernest Ansermet, conducted the premiere. From 1921 to 1939 Manuel de Falla lived in Granada, where he wrote the puppet opera El retablo de maese Pedro (Master Peter's Puppet Show, 1923) and a concerto for harpsichord and chamber ensemble (1926). In these works, the Spanish folk influence is somewhat less apparent than a kind of Stravinskian neo-classicism. Also in Granada, de Falla began work on the large-scale orchestral cantata Atlàntida (Atlantis) based on the Catalan text L'Atlàntida by Jacint Verdaguer, which he considered to be the most important of all his works. Verdaguer's text gives a mythological account of how the submersion of Atlantis created the Atlantic ocean, thus separating Spain and Latin America, and how later the Spanish discovery of America reunited what had always belonged together. De Falla continued work on the cantata after moving to Argentina in 1939. The orchestration of the piece remained incomplete at his death and was completed posthumously by Ernesto Halffter. De Falla tried but failed to prevent the murder of his close friend the poet Federico García Lorca in 1936. Following Francisco Franco's victory in the Spanish Civil War, de Falla left Spain for Argentina. He died in Alta Gracia, in the Argentine province of Córdoba. In 1947 his remains were brought back to Spain and entombed in the cathedral at Cádiz. One of the lasting honors to his memory is the Manuel de Falla Chair of Music in the Faculty of Philosophy and Letters at Complutense University of Madrid. Composer Manuel de Falla as depicted on a former currency note of Spain. At a time when there was very little serious art music being produced by Spanish composers, Manuel de Falla earned a reputation of being the first important Spanish composer of the first half of the twentieth century. By incorporating the melodic, rhythmic, harmonic, and structural characteristics of Spanish music into his compositions, Falla followed the "nationalist" tendencies of many other composers of the late nineteenth century (Grieg, Rimsky-Korsakov, Dvorak, etc.) who juxtaposed folkloric musical materials with traditional "classical" forms. Burnett, James. Manuel de Falla and the Spanish Musical Renaissance. Gollancz, London, 1979. Hess, Carol A. Manuel De Falla and Modernism in Spain. University of Chicago Press, 2001. Lee Harper, Nancy. Manuel de Falla. Greenwood Publishing Group, 1998. History of "Manuel de Falla"
This page was last modified on 10 August 2018, at 18:40.